From goodreads: Keeping secrets from a psychic can be murder. Petra Maras lives a charmed life, but only in the magical sense. Her absentee father is a criminal, her mother is emotionally dead, and everyone at her new school knows she comes from a family of witches. All she wants is to be normal, but that’s impossible, given her family. And given that she’s psychic. When the police request help with a murder investigation, Petra reluctantly agrees. Which isn’t such a good idea since the prime suspect wants to date her, and she really wants to say yes. Her gut says he’s innocent, but since she can’t get a read on him she can’t know for sure. And when she discovers he’s been keeping secrets, she wonders if maybe she’s been following her heart instead of her head. This is the debut book by Sara Hubbard and I thoroughly enjoyed it. Her writing is wonderful and the characters in this book are fully developed. While I have a soft-spot for PNR/urban fantasy, I have never read a book on witches and I was pleasantly surprised with how much I liked it. I believe this book to be a character driven book and bravo to Sara because I think she nailed it! 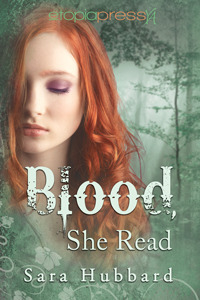 Blood, She Read is about the murder of local teen by the name of Josie and this is how we are introduced to the heroine, Petra Maras because she’s going to help solve the mystery. However, there wasn’t one storyline happening, there were a few and to me, I found it to be distracting from the original plot of PNR murder-mystery. It was also light on the romance and I wanted more of Finn and Petra. Petra is the type of heroine that every book should have, she’s strong and brave but she’s also vulnerable. I found myself invested in her and I loved how her world turned into complete chaos and there certainly wasn’t a dull moment in this book. There are so many different relationships in this book that the one I found to be the most interesting and yet odd was the relationship between Petra and her mother. One minute they were BFF’s and the next minute they were at odds. Truth be told, I didn’t care for her mother because I found her to be mean but every book needs a character that is unlikable!!! Then there is the friendship that she forms with Dylan, her classmate and he’s a crucial character to the story and that relationship will prove to be more than interesting!!! Again, this book is heavy on the character driven side so it will not leave you wanting and that’s what I truly loved about this book. My final two cents: I thoroughly enjoyed Blood, She Read and I look forward to reading more books by Sara Hubbard!